corporate manslaughter charge being levied on the blogs. to go back as below, both the line in general and the legal line? working with the Police with their ongoing investigation into what happened. This is part of TfL’s ongoing commitment to make roads safer for all users. TfL has not yet acted when a report three years ago raised concerns about this junction. Kings Cross this morning, so we expect it will run at lunchtime. Tom E in the next half an hour. neither of which involved cyclists. junctions around Kings Cross in time for the London 2012 Games. achieved at the three junctions outside Kings Cross. number of the recommendations from both the 2008 and 2009 report. efficiently for all transport modes, especially pedestrians and cyclists. will reflect the needs of all road users, including cyclists. • We plan to remove the existing pedestrian island on Pancras Road. well as change the location of the ‘no stopping’ yellow box. This entry was posted in Bad Gyrations KX Campaign, Road Safety in Kings Cross. Bookmark the permalink. Unhelpful and inappropriate? Well, they would say that, wouldn’t they? You took the words out of my mouth! The fact that they are rattled perhaps means that something worthwhile will come from the pressure being put on TfL. I have never been to ‘the blogosphere’ so I have no idea what TfL is talking about. I’m a citizen like everyone who lives in KX, works in KX or travels through KX. How can we hold TfL publicly to account… well, the only way seems to be by charging them with manslaughter following deaths resulting directly from their negligence in maintaining what they knew to be hazardous road layouts. Public bodies being called to account by citizens is an essential part of a democracy. Oh, but then… that is unhelpful and inappropriate isn’t it – democratic processes waste so much time and money, which after all are the important things here. 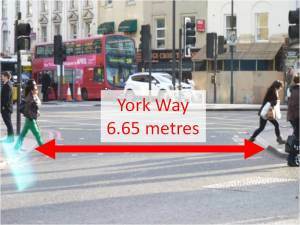 However, the highway code and the manual for streets indicate priority should be given to pedestrians and cyclists, and TfL is obliged to make highways in King’s Cross safer public places for all street and road users, not just motorised traffic. The whole gyratory is bonkers and while most of the posts deal with cyclists (and for good reason), as a KX resident and car-owner and frequent driver (yes, shocker…) the junction does not work for anybody: pedestrian, cyclist, or motorist. I think a much more radical re-think is required than the one proposed that is being implemented. There is a huge amount of space wasted in York Way with buses standing (often with engines running). There ought to be a return to proper two-way running of what is, after all, an A Road. Junctions should be controlled with traffic lights. This is what would happen in any well organised European city such as Berlin.